Here are five items that I have been really loving lately. Unfortunately the zip case from mr wonderful shop is not available but you can find a similar one here. 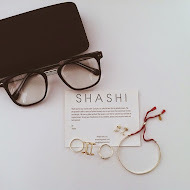 The brand of the glasses is named Komono and they are from one of my favorite websites MORE IS LOVE . The website is as perfect as it's name! You can find them here. The beautiful necklace is from Boe and it is also available at MORE IS LOVE, you can find it here. I will confess that I haven't stopped wearing the necklace since I got it. I love short length chain necklaces and this one is 12 cm (perfect length). The two rings can complete a simple outfit they are from GOOD AFTER NINE . You can find the rings here & here & here.